The Clermont Catholic Church was completed and consecrated October 1895. Located on the hill near the residence of W.P. Mulhern, it had white walls. The alter was white, trimmed in light blue and gilt. L. Koenig of Smethport did the painting. A special consecration service service was held with Rev. Tobias Mullin, Bishop of Erie, presiding. Joining him were Reverends Flood of Eldred and Galligan of Smethport. A special train ran from Eldred for the occasion. A special dinner was then held in the dining room of the nearby Bayer House. It was noted the Protestants were as generous as the Catholics in donating for the church. Services were held every other Sunday afternoon, with Rev. Galligan alternating between St. Elizabeth's in Smethport and Clermont. This church was called Saint Sabinas Catholic Church, and was the scene of many funerals and weddings in the early part of this century. Later the name was changed to Saint Celistus Catholic Church. Over the years there were a succession of priests in charge. Rev. Father Francis Doyle was the pastor in 1905 and continued until November 1908 when the Reverend Father Carpenter took charge. He continued until the early Twenties when the pastorate was assumed by the Reverend Father Charles J Liebel who continued until the church closed in 1925 or 1926. 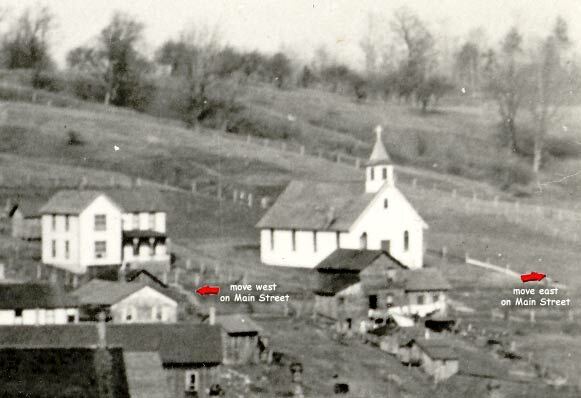 One of the last weddings performed was that of Marian Bloomster and Bob McKean who were married in that church Tuesday morning, February 24 1925. At the time Marian was a teacher at the Wermwag School.